"Honey! The dog's eaten your underwear again!" You see, dogs use their mouths as a way of exploring their surroundings. This is how they 'check things out' (through smell, taste, and texture) so chewing is a natural instinct for your dog. And although all Miniature Schnauzers chew... some simply desire to chew on things more than others. Chewing is purely a pleasurable activity for dogs and not a problem until... your dog gets ahold of something you value. Then it's just destructive. 1. Dog's Natural Instinct - As mentioned above, your Schnauzer chews on items as a way to explore his surroundings. 2. Puppy Teething - Miniature Schnauzer puppies chew to help relieve the discomfort and pressure during the teething phase of their development. 3. Chewing is Pleasurable - Dogs chew on things to help pass the time and when it's on something that tastes good, it’s self-rewarding, too. 4. Bored or Lonely - Dogs begin chewing as an outlet for a their emotions. The repetitive act of chewing is soothing and brings a dog comfort, much like our comfort foods. note: A Miniature Schnauzer suffering from separation anxiety may also exhibit destructive chewing. Read more about separation anxiety in dogs and how to modify this undesirable behavior in dogs. So now that we know why our dogs chew, how do we prevent them from destroying our valuable possessions? The answer is simple: You have to train them. • Take control of the situation by being responsible for your own possessions. First things first... dog proof your home. Take whatever it is you don't want to end up in your Miniature Schnauzer's mouth, and put it up. Truly make sure it is unavailable by placing items inside closets or up high enough where your dog won't be able to jump up or climb up to get to them. note: The most common and available household items dogs find to chew on include magazines and books, eyewear, clothing, shoes, garbage, cameras, cell phones, remote controls, house plants….... So be sure to have these type items put away so your Schnauzer cannot access them. AND never ever leave out any snacks or food of any kind. Food items must always be securely put away. • Prevent the destructive chewing in the first place. In other words, monitor your dog. Don't allow your dog to chew on forbidden objects. When you are away, confine your Miniature Schnauzer to his crate or a dog-proof room in the house, until you're confident your dog understands the house rules. Giving your new puppy or dog free run of your home when you are not there to supervise, only sets them up for failure. • Make clear distinctions between appropriate items and forbidden items. Your Miniature Schnauzer cannot decipher between a good pair of slippers and an old worn out pair you don't care about. So don't let your dog chew on an old slippers you were planning to toss out and then get angry when he begins chewing on your brand new slippers. 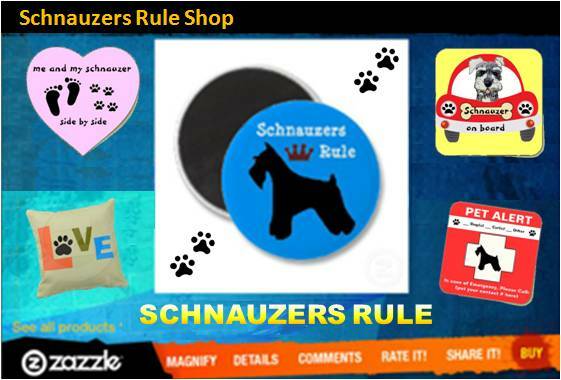 • Provide your Miniature Schnauzer with lots of tasty alternatives to your stuff. Remember, dogs chew as a way of investigating objects, especially if they are under the age of three years. So go buy lots of pet-safe dog toys and dog chews with different textures and sounds. Let your Schnauzer have access to about 3 to 5 toys to play with at a time. Rotate the available toys every few days to keep things interesting for him. • Spend quality time with your Miniature Schnauzer. Your Schnauzer can't learn what you expect from him, if you don't spend time supervising and training him. Teach your dog throughout the day as he explores his surroundings. Give proper correction so he knows what you expect from him. Your Schnauzer will soon learn what is and what is not appropriate behavior. • Be Consistent with Commands and Stay Positive. It's important to remain positive during the learning process. You want to build a strong relationship of trust with your Miniature Schnauzer, not one of fear. And never punish your Miniature Schnauzer for any destructive chewing after the fact. If you find an item has been damaged or destroyed, remember who left it out and available for your dog to reach. Then go scold yourself. Your expectations should be realistic. It will take awhile before your Miniature Schnauzer is completely reliable and no longer exhibits signs of destructive chewing. And even then, if left alone for long periods of time, dogs may resort to chewing on a forbidden item mainly for comfort. If that happens, don't over react. Continue spending quality time with your Schnauzer and take all the necessary precautions to prevent bad behaviors so your dog's learning process is a success! "Knowledge Share"... If you found this article on Destructive Chewing helpful and informative please share it with your dog-loving friends by clicking on one of the share links at the top right or bottom of this page. And please share your personal experience on the subject by posting in the comment section below.